The holiday celebrations are over at my house and all the Christmas gifts and packages have been opened, the wrappings and boxes carted out to the trash and recycling, and family guests' travels have brought them already back to their own homes. So I spent a quiet, very bitterly cold day yesterday making thank you notes. 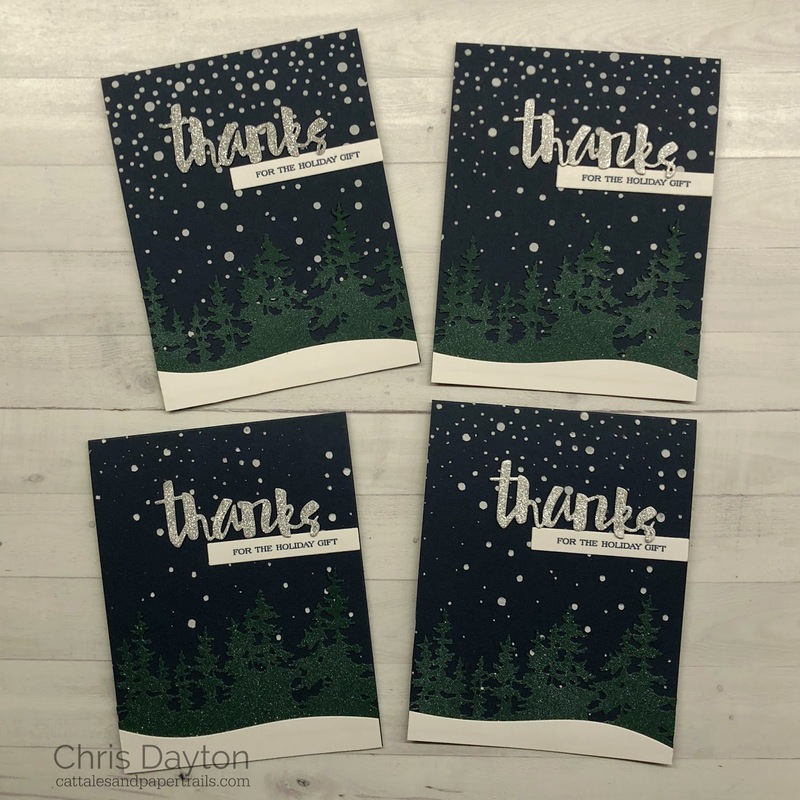 I used a variety of products to create several of these thank you cards. I added thin glitter paper to a piece of Decofoil self-adhesive foam sheet. I used the Falling Snow stencil from Simon Says Stamps and Ranger Texture paste to create a snowy background on a top fold Gina K In the Navy cardbase. I cut trees using the Sizzix Treeline die from a deep pine green cardstock, and spattered Ranger Picket Fence Distress paint on the diecuts using a toothbrush to pick up paint, and brushing my thumb against the bristles to flick tiny particles of paint. I also used the Painted Thanks wafer die from Simon Says Stamp to cut the glittered foam. I used the IO Stamps Hill and Landscape Layers dies to cut the curve of the snowy layer from white cardstock. I used my original MISTI and the Creative Corners to stamp sentiment strips with a greeting from the Holiday Thanks stamp set from Papertrey Ink. And finally I assembled the pieces using Brutus Monroe craft glue.